Tirol’s mountain world is unique and distinctive with its imposing mountain peaks, mellow mountain meadows, crystal clear mountain leaks and rustic mountain huts. There are many climbing possibilities – from short routes to multi-day trips. Both beginners and pros get their money’s worth. You can do everything in Tirol, the heart of the Alps – from bouldering on sublime rock, enjoying the peacefulness when multi pitching, enjoying the view on the mountain peaks, ice climbing in winter to sport climbing on over 5.100 routes. There are more than 85 via ferratas in Tirol. If you want to slowly get used to rock, you can visit a climbing park or one of the 27 certified family-friendly climbing gardens. Professional climbing guides can support you – indoor and/ or outdoor. If the weather is bad, there are many climbing gyms where you can let off steam. Tirol’s 16 tourism regions – from St. Anton, the Steinberge mountains up to Osttirol – are great for climbers of all ages groups and difficulty levels. The panorama view on Tirol’s mountains is superb and unforgettable. 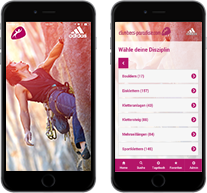 The sports climbing areas in Tirol are already covered to a large extent. Almost daily, the climbing offer is expanded. Numerous tours in all difficulties await beginners, alpinists, athletes and extremes. From top-rated beginner tours to alpine tours, everything is offered! From the practice trail to the alpine climbing route, everything can be found here! Climbing without rope and belt to improve the dynamics of your own climbing gear. The goal is a flowing movement - the so-called "flow". You can climb all year round and in different elements - even in the ice. Here you can find so many insider tips. How about a climbing trip for the whole family? No matter whether big or small, there are numerous possibilities in all of Tirol. Here you will find a large number of climbing parks, Low ropes courses. What to do in the evening, in winter or bad weather? Numerous climbing and bouldering halls are ready for mooving! Please notice the actual warnings!